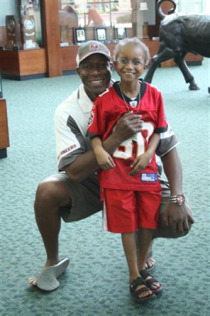 We had the pleasure of meeting Justen and his family at our 2009 football camp at the University of South Florida. Justen and his family graciously agreed to come out to the camp and meet with the coaches and participants to explain the dire need for research towards a cure for pediatric brain tumors. Despite being in the midst of his own battle and difficult treatment protocol, Justen toughed it out in the scorching heat and spent the afternoon charming every person he met. Justen earned his wings on June 27, 2010 at the age of 11. God bless you Justen. Justen Graymond Jones 11, of Apollo Beach, Fla., passed away peacefully Sunday, June 27, 2010, after a courageous battle with cancer. Born May 2, 1999, in Orlando, Fla., to Grayrich L. (Teresa) Jones and Renee G. (George )Beckford. He is survived by his devoted parents; loving brother, Brandon Jones; step-brothers, Tramaine Beckford, George Oglesby and Stephen Kreilkamp; maternal grandparents, Charles and Estella Jones; paternal grandparents Verna and Augustus Green; a special cousin, Kayla White; and many other family and friends. Donations can be made in Justen' s name by visiting www. childrenscancercenter.org or www.1voicefoundation.org. Justen was an angel. He will always be loved, remembered and missed.